The name Ok Go is synonymous with creative excellence. Known for their unique pop sounds, Ok Go has solidified themselves into icons of the alternative scene. The band’s innovative, and unique music videos have been viewed hundreds of millions of times, and their latest album, Hungry Ghosts has been wildly heralded as one of their best yet. 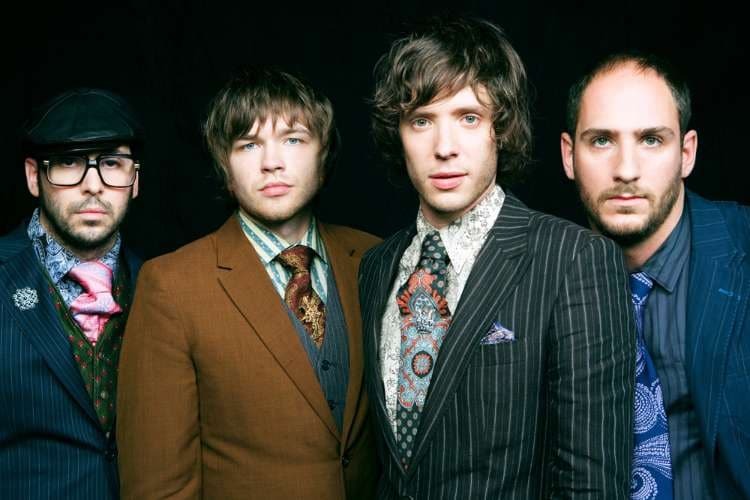 I talked with Damian Kulash, singer of Ok Go, about their sound, videos, and projects. Evan Almeida: Hungry Ghosts marks a shift in direction, and sound, for Ok Go, as compared to earlier albums. What inspired this change to a more ‘electronic’ sound? Damian Kulash: It wasn’t really a decision that we made in advance, it was inspired, and conceived in the moments that felt the most emotional. We created the sound around that, playing around with beeps, and chords, until we could find an arrangement that could convey this emotion through sound. So, for whatever reason, this record, Hungry Ghosts, came out more electronic sounding. However, I would say that this was more of a transition back to our roots than anything else. Everyone in the band is a child of the 80’s, and this record definitely feels like it has a lot of 80’s pop influences – it’s still the same structured pop music, but with more of a New Wave sound. EA: Well, on that note, what artists did you pull inspiration from, during the production of this album? DK: Well, I definitely think that a lot of New Order can be heard, then Prince inspired bits will show up sometimes, as well as INXS here and there. However this album is less ‘us hearing something and wanting to make something like that’ and much more of a ‘this is the band speaking the language that they grew up with’. This sound is just where our roots come from, it’s where our brains go when we try to write our music. EA: So, with lyrics such as: “So just tell me what’s going on (“Turn Up the Radio”)”, “It all seemed so fine until it was not (“Another Set of Issues”)”, and “it seems like forever since we had a good day” (“The Writings on the Wall”), it feels like Hungry Ghosts is meant to appeal to people who are in the process of a separation. Did you go into this album with the break-up motif in mind? DK: No! 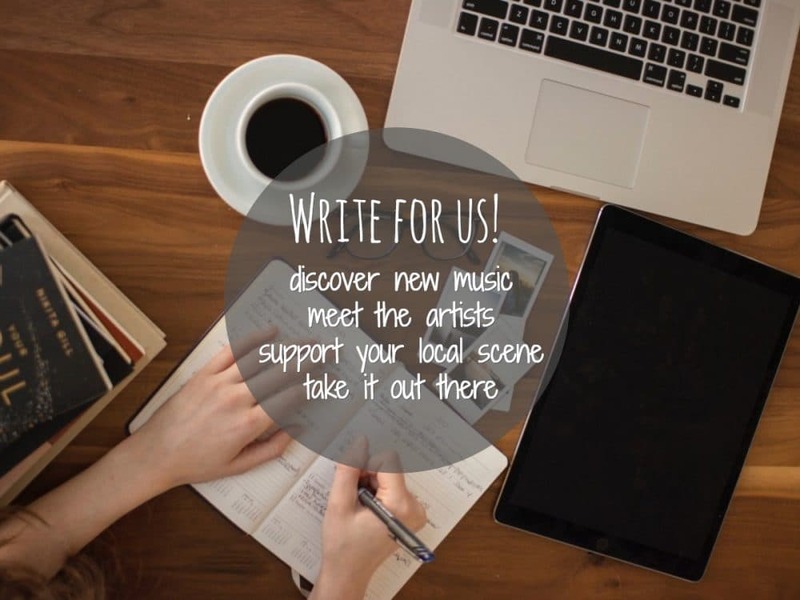 It’s part of the idea that we don’t like to set things in advance of writing an album. It’s more that we were writing from the places in our heads that were emotionally relevant at the time. It was only we were about 80% done with the record that I began to see my own reflection in the songs. The things that resonate with you right now, are different year to year, and person to person, and this album came from an emotional place that just resonated at that time. So the pattern in this album emerges because these songs feel like break up songs. I would start writing a love song, and it would inevitably veer towards a break up song. I didn’t know why until I could step back and see that a story was being told here. EA: Did you find that going back to your roots allowed you to be able to tell this story? DK: It definitely felt like we were figuring out our voice in that way. In the earliest days we completely thought things like “I want to write a stadium rock anthem” and just sit down and write one. Now it is a much more … loose – for lack of a better term I will use ‘experimental’ – process. We didn’t go into the studio knowing that we were going to come out with a disco track, like “I Won’t Let You Down” or this loudmouth electrical romp that turned out being “Upside Down & Inside Out”. It’s actually really nice to be able to go to the first recording not knowing what kind of style the record will become. We just went in and started listening for the ‘sparks’ in the songs that showed us where we should go with the music, and that just brought out all of this emotion with the direction. EA: Speaking of “I Won’t Let You Down, at the end of the four day filming for the video, there were, purportedly, forty-four different takes, eleven of which being fully finished. How do you decide on whether you should film yet another take, or when you have the best possible film? Does this ever lead to any artistic compromise – where a shot may not be entirely perfect, but you simply cannot film it again? DK: Yeah, actually that happens all of the time. The video for “White Knuckles” – which was on our last record – required dancing, and the usage of 14 dogs. We did 72 takes, and got a really great one at 72. We thought, that was pretty great, but we could probably do better, so we did another 50 something takes, I think that we ended up with 126 takes … we never managed to beat 72. 72 was the one that worked the best, so that’s the one that we went with, because we always just want the very best take. EA: What kind of limitations did you have on the filming of the video? DK: So, with the shooting of “I Won’t Let You Down” – which was in Japan – light was a huge factor, because we were shooting outside. So there was a set time at which we just had to stop because the weather was changing. By the time we were close to being done, we knew that we had three usable takes, and choosing the best one, the most magical one, to use requires me to sit down and examine the various elements of each of the takes. However, the final shot – where the camera shot goes aerial, and you can see over 2,300 people doing an umbrella dance – was actually shot in chunks. EA: Why film in units? The trademark Ok Go video is a single shot, why change the format? DK: This was due to the fact that 2,300 of the machines that we were using do not exist yet, which forced us to film in batches. We knew that in order for that to flow seamlessly, we needed to get all the filming done on the same day, before the lighting changed. We had to do the math and stick to a pretty rigid timetable to get that done, so the number of takes ended up being greatly limited by that, which made choosing at the end a lot easier. EA: Since “Here it Goes Again” every subsequent video that Ok Go creates seems to be grander, and more complex than the last. Do you ever go into the planning stage of a video thinking, something along the lines of, “alright, that last one was took 126 takes, but now we have to go bigger!”? DK: Pretty much always! However, it’s not a matter of us trying to ‘top’ ourselves it’s just our way of expressing ourselves in a new creative direction. The things that we haven’t done are much more interesting to us, than the things that we have done. I feel like we are always trying to stretch ourselves a little bit to see where we can go. I do have to say, though, that “I Won’t Let You Down” will be hard to match in scope. The immensity of the project, which ended with thousands of people being seen in a half-mile shot. EA: Well, you never seem to have fallen into a idea rut when it has come to your videos. I’m sure that you’ll have no problem conceiving of a new one-shot acid trip. DK: I hope that you’re right! The one thing is that, for our last album, we released between 8-10 videos, and we knew which ones were going to be the big hits. Dog dancing is going to be more viral, and catchy, than an animation using pieces of toast. Even though I like both of the videos, we knew that some songs, and videos were more “pop-py”. We haven’t really had the chance to evaluate our newest album like that yet. The first two videos have been these huge viral things, so maybe this will let us do a few more off-the-wall ones, with the success of the first two. EA: Do you ever worry about the viral success of your videos overshadowing the music? DK: In my own opinion, no. I know that’s how people feel about us, and that’s sort of annoying at times. However I like to think of our popularity as though we are a restaurant that is known for our desserts, people are coming far and wide for these awesome desserts, but we still make really great main courses too. It’s great if people come just for the main course, and it’s great if people only come for the dessert, there are no bad customers. To me, the idea that one part of our music is somehow undoing the success of another part of our music is crazy to me. Another way of thinking of it, is that there is no way that you can make music that everyone in the world is going to love, so we exist in a place where we attract fans who may not love our music, but still like our videos. EA: So despite the disconnect between some of the fans of the videos and fans of the music, you actually see the diversity in your fanbase as a positive thing? DK: I like to think of myself as a realist, I know that there are people who aren’t going to care for our music. Anyone that tries to pander to everyone in the world is going to make unquestionably terrible music. Some people do try to say that our videos are bigger than the sound, and that’s always been mildly irritating to me, because they are complementary works. These aren’t separate pieces, they work together and bring new people to our music. We spend all of our time chasing creative ideas! Sometimes these ideas are about new recording techniques, videos, app development – we put out a social media game a while back – that had nothing to do with our songs, or our videos, it was just a fun game – we’re also working on a game show right now. Again most of these endeavors have nothing to do with the music, it’s all about expressing ourselves creatively in the ways that we enjoy, and that people respond to, and enjoy. EA: In your opinion, what was the best album of 2014? DK: I really liked the Jungle album, it had a really unique sound and I really clicked with the record as I was listening to it. 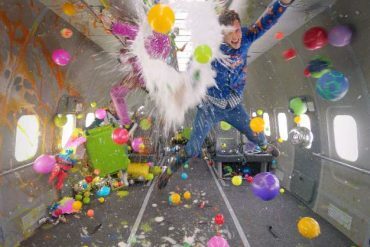 EA: What are the plans for Ok Go’s future? DK: We are touring, touring, touring! We’ll be in Europe in the spring, then it’s off to Russia and Japan, then we’ll do a run in the states. We’re also working on a TV show, more videos, music. We really just did a complete overhaul of the show to include some spectacular stuff that I have never seen before, and I am very excited about it. EA: Question from the readers: Which video took the most work to pull off, or was the most physically and/or emotionally strenuous? DK: The video for “Needing/Getting” was the most emotionally strenuous, and definitely took the most work to pull off, just really an incredible, incredible, amount of work. Physically it would have to go to the “All is Not Lost” video, just because the video incorporated professional athletes and we had to try and keep up with them.